The travel industry has long sought to understand the millennial mentality, including how their attitudes and preferences impact where they go, whom they travel with, and how much they spend. Now that some millennials have begun to have children and raise families, will their travel behavior change? As part of the U.S. Consumer Travel 2018 series, a Phocuswright travel research report, Family Travel, examines the state of U.S. family travel, including a comparison of family travel-related attitudes and activity across generations. Family trips are an important piece to the travel industry due to the complexity of the trips and relative higher spend they create. This complexity makes travelers typically book earlier and spend more time researching. In 2017, a third of U.S. travelers took at least one trip as a family with children (under 18 years old). By driving to their destinations, families save on airfare and are thus more likely to take a longer trip and spend more for lodging and in-destination activities. 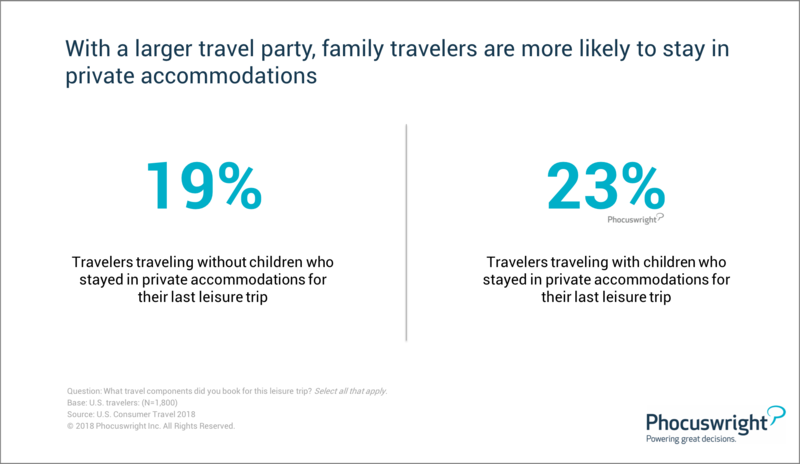 With a larger travel party, family travelers are more also likely to stay in private accommodations. This makes families, and millennial families especially (whether as parents or part of a traveling family), a highly attractive demographic for companies in private accommodations and tours and activities. For more on family travel and a deep dive into U.S. consumer travel, purchase the series or subscribe to Open Access. The Phocuswright Conference features innovation demonstrations, breakout sessions and speakers focusing on private accommodations. Check out the full program here and register here (save $200 through Oct. 31).